I used embroidery floss to make the cover for these pens. 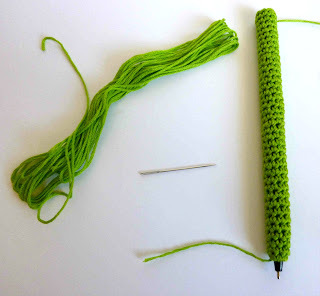 If you've ever crocheted with embroidery floss before, you know it doesn't behave the same way that crochet threads do... But it comes in such wonderful colors, I just can't help it! The pattern is very similar to the Fancy Pen pattern. Make the tube long enough to cover your pen (between 35 and 40 rows). Try it on the pen to make sure! :D When you know it's the right length, fasten it off. Leave a 5" tail (approximately, no need to get out a ruler) for the next part. Get out your super glue and tapestry needle. Put the cover on the pen with the magic loop end at the writing end, and the open end at the back end of the pen. Pull magic loop end tail really snug and weave the end in. Use a running stitch and weave the back-end tail through the last row of stitches. Pull the tail so that it gathers the stitches together, don't weave the tail in yet. Just stick the needle in the end stitches (out of the way) while we do this next part. Put a few drops of super glue at the tip end of the pen. Be careful. If you add too much it will saturate the fibers and cause them to discolor. Use it sparingly! 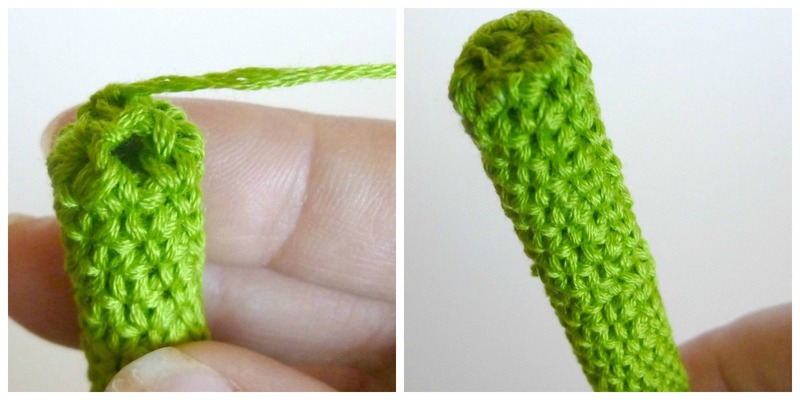 Let it dry before you do the other end (less than a minute, and you'll be good to go). Now to glue down the back end! There may be a small space where you can slide the super glue nozzle in between the crochet casing and the pen. If there is, use it! Otherwise, loosen your stitches a little and go in from the top. You're going to have to work fast, because super glue dries faster than you think. 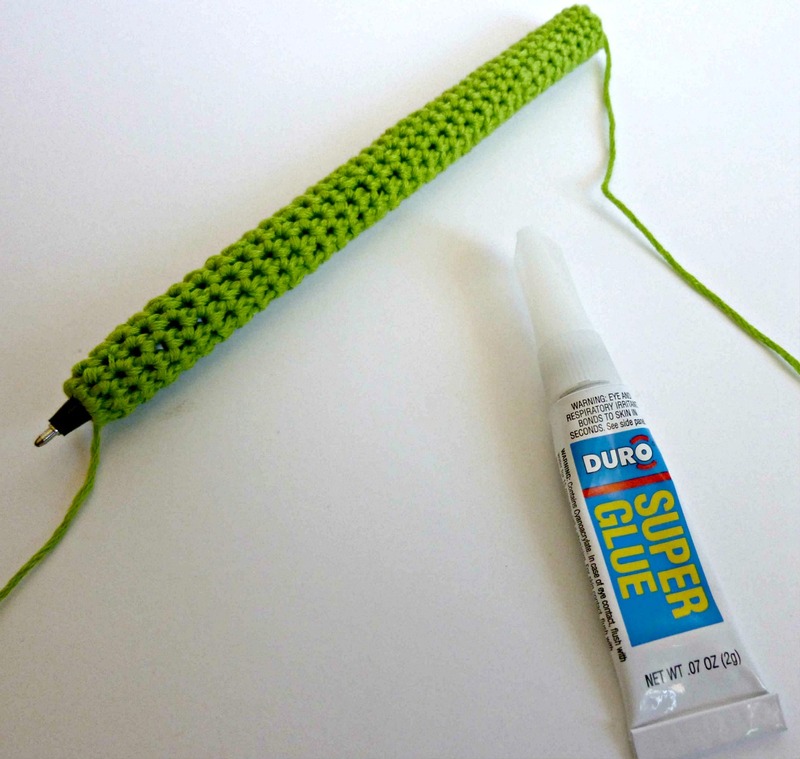 Put a few drops of glue on the back end of the pen and then quickly push the stitches down on top of it. Hold it in place for a few seconds, so that the glue attaches to the cover. Once it's attached, it will be hard as a rock. 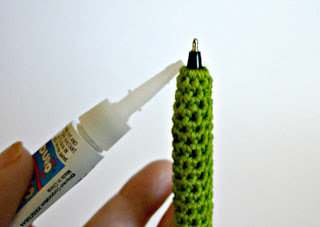 You may have to use your embroidery floss tail end (that you have not woven in yet! Yay!) to cover any open spots in the end of the cover. It should look uniform and lovely, but if you get a little too crazy with the glue and end up with a discolored section, we'll just cover it up! So no worries! At this point, your embroidery floss covered pen is finished. If you love it just the way it is, you can stop at this point. 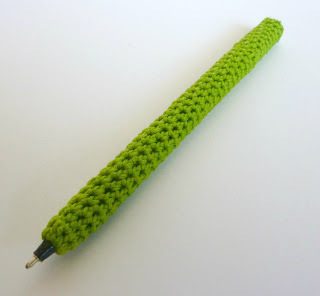 This pen reminded me of Rita Skeeter's Acid Green Quill Pen (minus the quill, of course...). Or you can turn it in to an awesome batty pen! This part is easy. Start with the felt. I found it easier to manipulate when I cut it into 1"x3" rectangles (approximately). Fold the rectangle in half to make an almost square 1"x1.5" piece. Now get out your scissors (your good scissors will make this project easier, your kid's blunt paper scissors are going to make it harder. Just sayin'). These bats are pretty tiny. I scanned the template below from a drawing I did that is the right size, but honestly, I think you'll be better off not printing it out, and just using it as a starting guide. 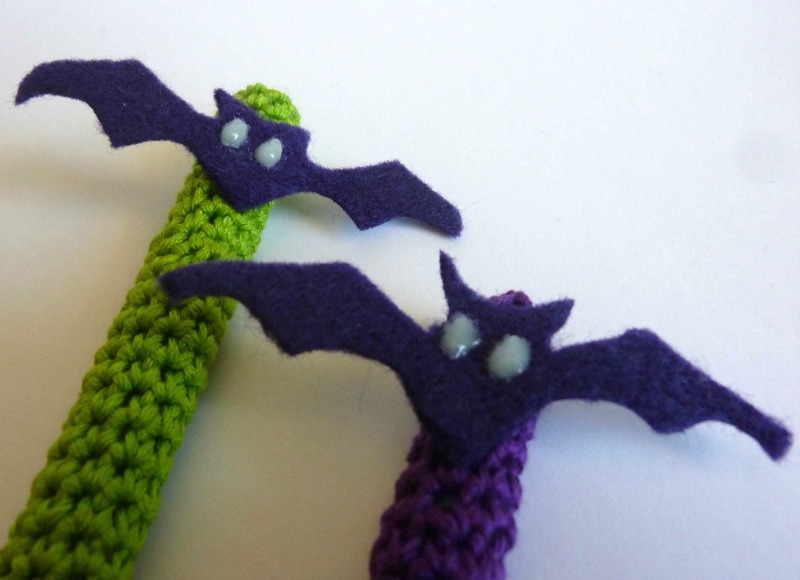 Think of these bats like snowflakes, you want them each to be a little different. That's what gives them their personality! So, you can pin the template to the felt and cut along the template lines, but I think that you will find that it makes the cutting harder and fiddley. Okay, back to the project. and print it out with whatever software you use to print pictures. 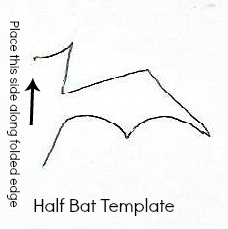 Line the template up with the felt, making sure that the folded edge is along the bat-body side of the pattern. 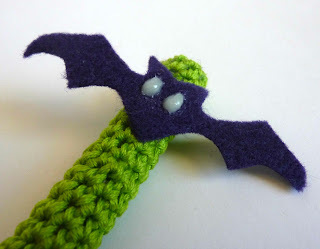 Cut out your little bat! Adorable. Cut out 2 more to put on bobby pins for your neighbor's daughter. Cut out another one and tape it to the cat's collar. Aww. Isn't he cute? Take a picture and put it on Facebook. Now, go grab the glow-in-the-dark fabric paint so we can finish the pen already. Sheesh! It's pretty hard to best candy but I think you did. Great job. Aww, thanks! And they're fun to write with! They are sure to please; thank you for the pattern of the bat. Hi Line! I'm glad you like it! These turned out really awesome. Nice gift idea for co-workers! 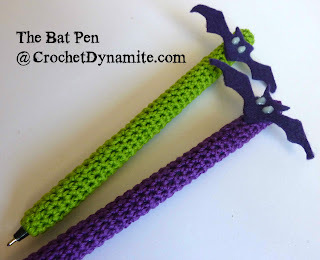 I'm going to try with a flower on the top instead of the bat. That way they're usable anytime of year. the girls are sure to love them! Thanks!